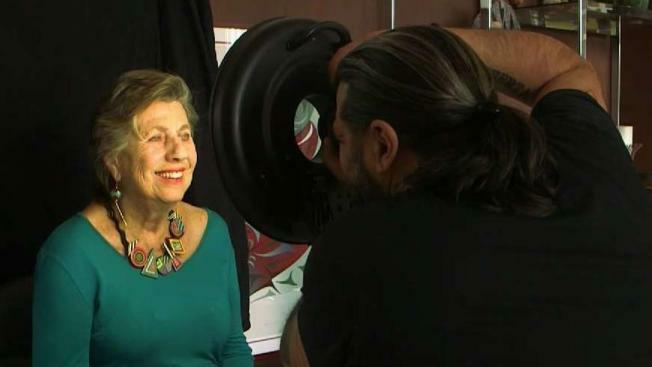 An unusual exhibit will open in San Francisco’s Civic Center this week, featuring the faces of dozens Bay Area Holocaust survivors blown-up to larger-than-life proportions. Joe Rosato Jr. reports. An unusual exhibit will open in San Francisco’s Civic Center this week, featuring the faces of dozens of Bay Area Holocaust survivors blown up to larger-than-life proportions. The month-long exhibit features the work of German photographer Luigi Toscano, who is traveling the world photographing survivors and displaying their large-format portraits in public spaces. The exhibit is titled Lest We Forget. "They are different people," Toscano said during a recent photographing trip to the Bay Area. "They are people mostly that survived the concentration camps." German photographer Luigi Toscano photographs 97-year old Holocaust survivor Ben Stern for an upcoming exhibition in San Francisco’s Civic Center. Toscano’s journey began with a visit to the infamous Auschwitz concentration camp about five years ago. He noted the silence. He walked around looking for someone to give him information about the history but saw no one. It set off his own quest to find out more — which lead him to photographing survivors — choosing to capture their faces in portraiture. "You can look at in the eyes," Toscano said. "You can really confront these people." The exhibit will feature eighty photos placed around Civic Center plaza. Toscano has staged similar exhibits in the Ukraine, Germany and recently in Washington D.C. It’s sponsored by the German Consulate in San Francisco and the Goethe Institut, aimed at spreading healing in a sprawling tragedy that still haunts Germany. "I think in Germany our society is still very much influenced and we have a horrible responsibility for what happened," said German Consulate General Hans-Urlich Suedbeck. "It’s part of our DNA as a country to deal with these issues in a way that is forward looking, in that it helps anything similar from happening again." On a day last month, Toscano visited the Berkeley apartment of ninety-seven year old Ben Stern, a Polish-born man who during World War II was sent to numerous concentration camps including Auschwitz. Of eight siblings, only he and a brother survived. A mockup of the Lest Be Forget photo exhibit which opens April 17th in San Francisco’s Civic Center featuring 80 portraits of Holocaust survivors. Toscano sat across from Stern listening to his stories of how he’d survived a death march that began with seven-thousand boys and thirty-three days later had dwindled to one-hundred and fifty-six. "I promised if I survive I will talk about it," Stern said as Toscano nodded and jotted in a notebook, "and I’m doing that." Toscano opened up his suitcase taking out a camera, a light shaped like a donut, and a black cloth. He quickly clipped the cloth to a shelf, positioned Stern in front of it and quickly snapped off a dozen pictures. Within minutes he was off to his next location. When Toscano began the project, the weight of the stories he was hearing began to bear down on him. He couldn’t sleep at night thinking about the harrowing tales — shuddering at the vast depths of cruelty his past countrymen were capable of. Ninety-seven year old Holocaust survivor Ben Stern tells stories of his life to German photographer Luigi Toscano. "I speak often with my friends about my experience so that helps me to take more pictures," Toscano said, "to take hearing more stories." The Goethe Institut in San Francisco, which promotes learning of the German language and culture, is helping to stage the exhibit which opens April 17th and runs through May. "I think the human being tends to forget," said Goethe director Sigrid Savels Berg. "We have to speak about it and we have to use the chance that we have in having the survivors with us still so we can hear the stories — that’s absolutely important." Toscano said the current turbulent political climate in the U.S. and Europe over immigration has helped motivate his work and pushed him to continue — delivering his message one face at a time. "I have a message in my work, you know," Toscano said. "My message — ‘if you forget the past we are damned to repeat it.'"